Your baby's neck is lengthening and the head is becoming more erect, meaning that they are beginning to appear less tightly curled up in a ball than they were. This week, hair growth is taking place, and not just on the baby's head. Hair along the eyebrows is also beginning to grow. 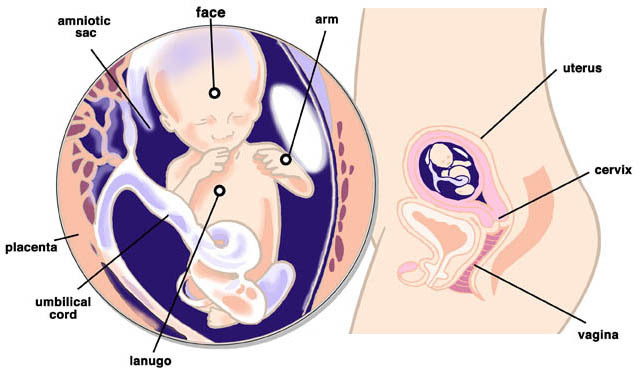 On top of this, your baby will be developing hair all over their little body, this is called lanugo. Lanugo is a very fine hair that is shed later on in pregnancy. Some babies still have some of this bodily hair when they are born, particularly if they are born prematurely, but don't worry if this does happen as the hair will fall out very quickly. Welcome to the beginning of your middle trimester, most probably the most comfortable of the three. Typically, women find that the more draining symptoms of pregnancy have subsided by now, and that they have more energy. Make the most of this and ensure that you are still including regular exercise in your daily routine. Every woman is different, and while it is likely that you are feeling the effects of a fuller waistline, you probably don't look very pregnant yet. Don't despair if your clothes are tightening but you feel as though it is too early for maternity clothes as there are plenty of solutions out there to help you extend the life of your trousers with button extensions and bump bands. And remember, you are likely to be more conscious of this body change than anybody else so whatever you do don't let it get you down. Before you know it you will be sporting a big old bump that leaves nobody in any doubt of your pregnancy! It is likely that you will be having your first scan sometime this week, if you have not already had it before now. You may find this scan quite an emotional experience so make sure that you talk through your feelings with your partner, and that they are there to support you on the day. It is natural to have concerns about whether the scan will bring good news, but stay positive, if you have come this far the odds are on your side. Many expectant mothers and fathers find the scan surprisingly moving or exciting. Actually seeing the baby wriggling around on the screen can really bring it home to you that you are about to become parents. The purpose of this scan is to date the pregnancy and establish a due date; to check that the baby's heart is beating; to assess the chances of Down's syndrome (by measuring nuchal translucency) and also to see how many little ones you are carrying. This scan is not intended to check for abnormalities. However, there are some development problems that can be seen at this stage. If you had a dating scan earlier than 11 weeks you may be called for another scan around now in order to conduct the nuchal translucency scan which can only be conducted between 11 weeks and 13 weeks and six days. This determines the likelihood of Down's syndrome and you will usually be contacted via letter with your results; these are presented as a risk of '1 in X' chance.